This new Visual field testing provides fast supra-threshold testing complete with statistical analysis in about 4 minutes. 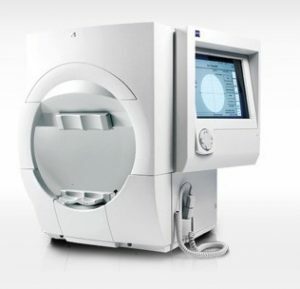 Visual field testing is a basic element in the standard care for glaucoma and all neurological vision loss. We are proud to screen everyone in our pre-testing with this proven diagnostic performance in detecting early visual field loss. 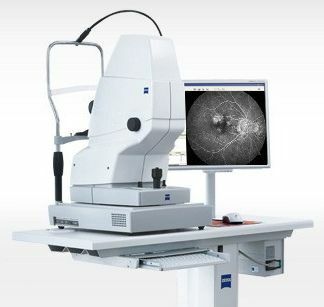 The Zeiss Visucam Pro-NM is a high resolution retinal camera that captures images of the back of your eyes. 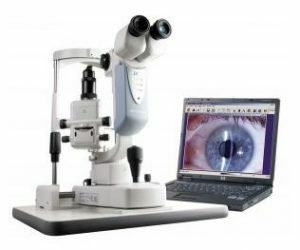 We use the instrument to photo-document conditions such as macular degeneration, diabetic retinopathy and other retinal diseases, glaucoma and other optic nerve disorders. 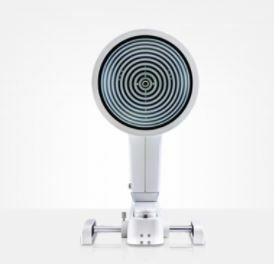 OCULUS Keratograph 5M is a cutting-edge piece of technology known as a corneal topographer. 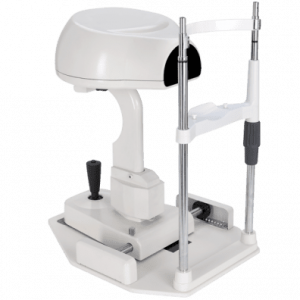 With its built-in real keratometer and a color camera optimized for external imaging, the Keratograph 5M produces incredible images of the unique contours of your eye, that are both extremely informative to your Raleigh eye doctor, and easy to explain to you, the patient. Two of the most common causes of blindness are glaucoma and diabetic retinopathy. It is important to identify and track these disorders over time and the use of this convenient technology greatly reduces the incidence of blindness. 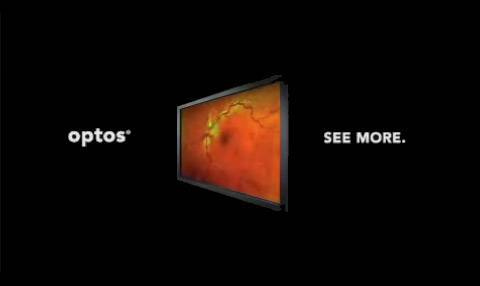 We offer baseline digital images to all of our patients…why rely on memory when you can rely on an image? 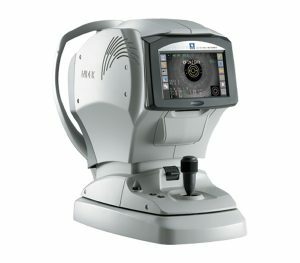 The TONOREF™ III provides the automated calculation function of the corrected IOP based on the central corneal thickness. Objective measurement of accommodation is performed with patient’s focusing on a target that moves from a distance to near. The large pupil zone imaging method measures the central refraction and a large area refraction.The difference in the measurement allows assessment of the effect of pupil size on vision under mesopic conditions. Topcon is the first in the world to introduce a combined anterior & posterior Swept Source OCT, the DRI OCT Triton. 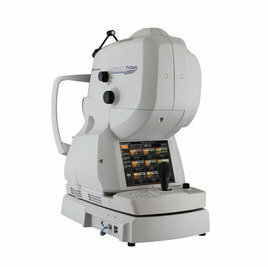 The DRI OCT Triton incorporates full color high resolution fundus photography and FA & FAF imaging. Optimized 3D Imaging by the sMap will create a complete model of the ocular surface. Utilizing the two and three dimensional maps of the corneal and scleral surfaces, our eye doctor can accurately assess how the each scleral lens will fit relative to the corneal and scleral surface with the highest level of precision. Plus, we can predict how the scleral lens will vault over the cornea and how it will align with the scleral surface. This allows for maximum comfort as well visual performance. 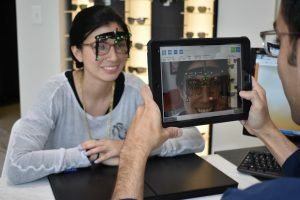 The OptikamPad iPad App is a complete dispensing solution that helps our staff assist patients find the perfect combination of frames & lenses. 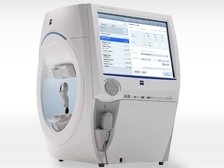 This revolutionary tool offers our patients a unique shopping experience. OptikamPad’s Automatic Image Detection allows all measurements to be obtained immediately after snapshot, avoiding time-consuming measurements. 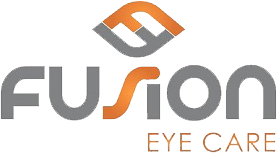 Visual Acuity for Mac is KyberVision’s desktop solution, bringing computerized versions of the “gold standard” acuity testing on the user-friendly Macintosh platform in the clinical environment and it provides an efficient and reliable assessment of visual acuity for literate & illiterate people as well as preschool children. 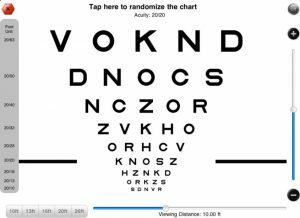 Moreover, Visual Acuity promotes the use of the logMAR chart design recommended by the National Eye Institute (NEI) and the International Council of Ophthalmology (ICO)to address design flaws in the Snellen chart. 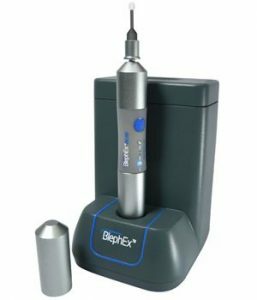 At the Fusion Eye Care’s Dry Eye Clinic we are pleased to offer BlephEx for treatment of blepharitis. This advanced technology allows us to provide powerful and effective treatment for blepharitis delivered in a comfortable, spa-like environment.